If you have decided to participate in the HPE6-A48 exam, Passquestion is here. We can help you achieve your goals. 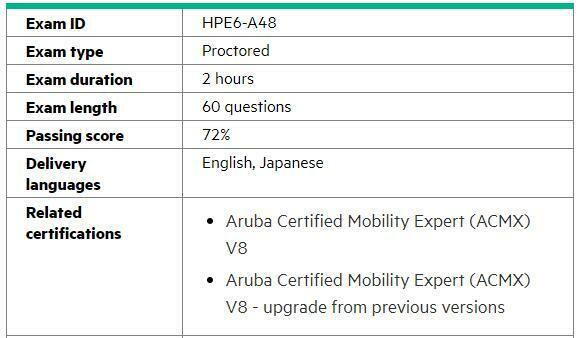 We know that you need to pass your HPE6-A48 exam, we promise that provide high quality HPE6-A48 Practice Test Questions for you, Which can help you through HPE6-A48 Aruba Certified Mobility Expert 8 Written Exam. HPE6-A48 exam tests your technical expert skills with WLAN design, implementation, and configuration in complex multisite highly available network environments using the Aruba Controller, Access Point, and AirWave product lines. It also tests your ability to design, implement, monitor, troubleshoot, and maintain end-to-end WLAN campus and branch solutions, and resolve issues in an existing customer infrastructure. A network administrator deploys APs with radios in Air Monitor mode and detects several APs and SSIDs that belong to stores next door. The Mobility Master (MM) classifies the APs and SSIDs as potential rogues. The network administrator wants to prevent the Air Monitor from applying countermeasures against these APs. How can the network administrator accomplish this? A. Select the BSSID and click reclassify, then select neighbor. B. Run the Define WIP Policy task, and define the BSSIDs of the neighboring APs as interfering. C. Select the BSSID and click reclassify, then select interfering. D. Run the Define WIP Policy task, and define the BSSIDs of the neighboring APs as Authorized.